ASTEROIDS - Cosmic gravel or the future of astrology? Space junk - that's what we always called it. And many astrologers still do of course, unwilling to complicate an already complex structure. We've got enough to think about with ten planetary bodies and twelve signs and houses, to say nothing of the sensitive points. Keep it simple is the mantra. But perhaps it's time to stop and take a second look at these thousands of asteroids - large and small -which are slowly entering into our consciousness as the scientific world maps and catalogs them. At one time, Saturn was the most distant planet which could be seen, and as such it symbolized our limits. But then Herschel discovered Uranus in 1781 and astrology was changed. From a metaphysical and psychological viewpoint the energy of a planet represents an aspect of consciousness, and it has been suggested that the name given to a newly discovered planet describes the principles of its symbolism. Like the accidental discovery of the planet with its unusual axis plane and rotation, Uranus describes the urge within us too to be unique, detached, free individuals. And so with the planet's entry into our consciousness, people the world over revolted to gain their freedom. The planet also has a connection with the rejection of paternalistic rules of order. The myth of Uranus, father to a rather weird bunch of offspring who tried , unsuccessfully in the end, to put as much distance as possible between himself and his children is appropriate for the symbolism which astrologers associate with the planet. With the discovery of Neptune, medicine, anesthetics, nursing, and homeopathy became a part of our lives. The God of the Sea led us into an other-world of drugs and illusions, spirituality and confusion. The discovery of Pluto coincided with the release of nuclear energy and with economic depression. Pluto was the God of the underworld and illustrates that which comes up from the deep; the dark, the sinister; guardian of the dead. The symbolism is all there. The question can reasonably be asked then, is the timing and naming of these discoveries merely coincidental or is it in some way synchronistic? It is certainly difficult to believe that it could be the latter. After all how could a scientist or astronomer or board responsible for naming heavenly bodies just `happen' to give them a name which `fits' the Universe' intent? And yet the evidence certainly seems to point in that direction. That being so, can we then reject out of hand that the discovery and naming of asteroids too must have similar correlations? The English have an expression, "the proof of the pudding is in the eating" so let's take a closer look at some of these chunks of gravel.. The first ones - known as the big four - were named for goddesses in mythology and they are Pallas, Vesta, Ceres and Juno, all of which were discovered in the 19th century. Now, just a short time later, the orbits of more than 14,000 asteroids have been logged and over 5000 have been named. You can imagine that its not easy to come up with so many mythological names, and indeed they have long since been used up. 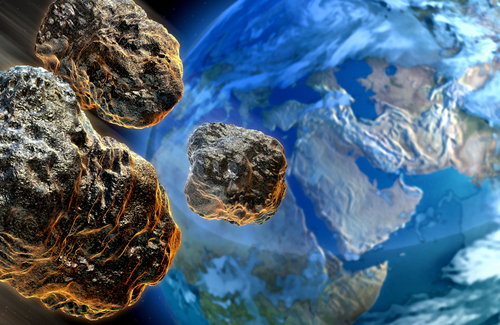 Nowadays asteroids are named for people and for such mundane things as beer! We are fortunate that astrologers such as Jacob Schwartz and Mark Pottenger have compiled name lists and ephemerides for so many. At last we can do the research which this rich, unmined field deserves. So let's take a look at some of the event data for which we can thank Jacob Schwartz, Maritha Pottenger and Dr. Zipporah Dobyns, all of whom are among the ranks of avid watchers of asteroids. In my own family the asteroid with the name most closely associated with each member was conjunct a planet or sensitive point in that person's chart. And the asteroid California is conjunct my Sun and my husband's Vertex. Our relocation to California 40 years ago was one of the major decisions of our lives. So - where is all that leading us? Well in my opinion we will have to do lots and lots of studying on this fascinating subject. So much to learn - so little time. Many Astrology computer programs now contain at least a few of the asteroids - check them out for yourself. And check out the Asteroids In Astrology section from AstrologyClub.org!